Software engineers have designed some impressive online platforms, and now these platforms are opening doors for current and future students. There are more online programs available at the master's level, but technological advances are creating new opportunities for undergraduates as well. Most students choose online learning for convenience and flexibility. These aren’t trivial matters. For some, convenience means being able to pursue further education without giving up the job they already have. A strong demand for app developers and electronics is driving multiple job offers for graduates of software engineering and computer science programs. Convenience doesn’t mean the education is second-rate. The coursework is not easier, but there are advantages for some personalities and some types of learner. Leann Christianson and Kevin Brown note in "Computer Science Students' Online Learning Experience and Workload: Perception vs Reality", that one plus is the ability to listen to a lecture over again until one really understands. Today's online learning is very different from traditional correspondence courses. Online students can attend live interactive classes. Schools like Colorado Technical Institute offer the same programs at physical campuses and online. Some online software engineering programs even manage to integrate project-based learning. Some universities have extensive online library resources available to their distance learners. They may have partnerships with other libraries so students can check out books from a location that's nearer to them. 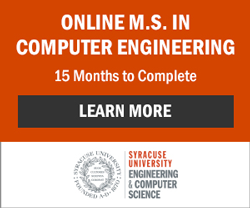 Check out four of the top Online Master's in Software Engineering degrees here. 100% online software engineering programs are in the minority. How different is the online experience from the traditional one? It depends -- there are different structures for different types of learner. Penn State, which offers an online master's degree in software engineering, groups students in cohorts. Students progress through the program together and develop relationships much like they would if they were attending class together in the community. Drexel University Online, meanwhile, allows students to decide how many classes they want to take each quarter and complete the degree on their own time line. Of course there are trade-offs. Some people feel more relaxed when they pace themselves, but others rely on structure. Some draw their energy from others on a deep emotional level. At the undergraduate level, software engineering programs typically include a capstone project which students complete in teams. To get the most out of the experience, team members interact with each other out in the community. Software engineers may be masters at virtual reality, but even they have limits. That may be why schools like Drexel University and Penn State currently offer the master’s in software engineering only at the graduate level. By this stage, students have typically proved themselves academically and professionally. Most students choose online learning for convenience and flexibility. Undergraduates, though, won’t be stuck going to class every day. Students should remember that here is a continuum between 100% classroom-based education and 100% online education. Many technology and engineering programs have some online content, as the ABET accrediting agency notes. However, 100% online software engineering programs are in the minority. Capella University and Regis University boast ABET-accredited online programs in fields related to software engineering, though they are not true software engineering programs. There are also software engineering programs that have school-level accreditation, but not program level accreditation. Some focus on particular aspects of software engineering like software architecture. Institutional accreditation, on the other hand, is imperative. How important program-level accreditation is depends on one’s career goals. If a person has her heart set on working with high stakes embedded software systems, she’ll probably want to make whatever sacrifices are necessary to attend an ABET-accredited program, be it software engineering or a related field like computer engineering. If he or she is more interested in business applications, however, she may find another program equally to her liking. Institutional accreditation, on the other hand, is imperative. Regional accreditation is sometimes considered more prestigious than national accreditation, but as long as a software engineering degree or school is accredited by some agency that's recognized by the Department of Education, it will be recognized as a degree. Some schools are more prestigious than others -- this is true online as well as off. A person does not have to be embarrassed, though, about having a degree from an online institution. With nearly 90% of state universities offering at least some online courses, and with respected professional organizations like the IEEE bringing continuing education online, e-learning has become mainstream!